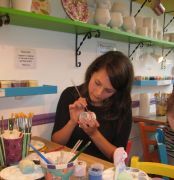 If you're looking for something to do to wile away a few hours, pop into Ceramica where you can relax and get creative by painting your own ceramics. We have a selection of over 100 ceramic pieces for you to choose from - from mugs, plates and bowls, to moneyboxes, photoframes and flower pots! We provide all the instruction that you need and we have plenty of samples, stencils and books to give you ideas. 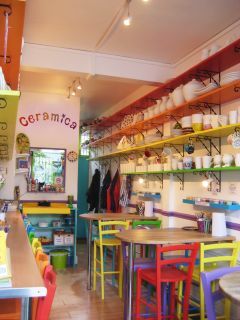 Our studio is bright and colourful and designed to inspire even the most unartistic! It really is the ideal place for a creative get-together! It�s as easy as 1-2-3! Choose your ceramics from our selection of over 100 pieces: you might chose a mug for your daily cup of tea or coffee, or perhaps something more unusual like a cupcake trinket box to keep your jewellery in! Get painting! After thorough instruction from one of our trained studio assistants, it�s time to get started. We have plenty of books, stencils, sponges and decorating tools if you�re stuck for ideas and during the whole process, a member of staff will be on hand to give you help, advice and inspiration if you need it. Once you have finished your masterpiece, you leave it at Ceramica for us to glaze and fire. It will be ready for you to collect one week from the day that you paint.